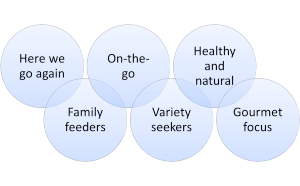 This market segmentation example looks at a segmentation approach for grocery buyers and shoppers. It is important to understand the underlying motivation and behavior of consumers in different market segments. This example of market segmentation clearly identifies that consumers have distinctively different needs, even though they may be shopping at the same retail outlet. This market segment views grocery shopping as a chore. They seek to reduce the time, effort and cost associated with shopping. They favor retail outlets that are conveniently located, have clear displays, and easy to find information. This market segment tends to be brand loyal to the retailer, as well as the brands that they purchase. This type of loyalty is termed “habitual loyalty” where the consumers in this market segment will repeat buy due to habit rather than any emotional or rational attitudes. They can be swayed somewhat by sales promotions and discounts, but are generally unresponsive to these offers, as opposed to some of the other market segments. As suggested by the name, this market segment has a main grocery buyer (usually a parent) that is buying groceries on behalf of their family. Their purchases will tend to be fairly regular at its core, with significant varieties from time to time as they are impacted by preferences of end users (often children) in their household. This segment purchases snacks and biscuits for an “eat-at-home” snack. And as a generally tend to have children at home, they will generally purchase larger quantities. While not as price focused as budget conscious consumers, good value is important to them. As a result, they tend to be attracted to well-known brands that run sales promotions on a frequent basis. This market segment of consumers tends to have a busy lifestyle, and offer involving work, travel, perhaps study, and sporting activities. As a result, the on-the-go market segment tends to be above average purchaser of ready to eat foods, snacks and other convenience foods. Because they are frequently moving around, they are more likely to have a larger set of retailers that they will visit. They also have a reasonable degree of variety in their purchases, depending upon their mood and other situational factors. Due to their busy lifestyle, they are probably more likely to engage in online shopping, as well as using vending machines. This market segment has little brand loyalty, as they enjoy variety in retail experiences, tastes and food choices. This means that they are more responsive to sales promotions and new product offerings, especially when they are first released. This means that they are generally and easier to win segment, but much harder to retain in the long-term. In other words, they will contribute to short-term sales results through sales promotions, but longer term image advertising is likely to have less effect upon them. This increasingly important market segment is concerned with the health and environmental impact of their purchases and will probably seek out environmentally friendly retailers as well. In terms of their grocery purchases, the healthy and natural segment will select products that are natural, fat-free, low-carb, vegetarian gluten-free, or some other health attribute. While some consumers in this segment are restricted by diet, most just want to pursue a healthy and active lifestyle. These consumers are typically more involved in their purchase decisions, making packaging design and information more important to this segment. They typically want to deal with brands that they can trust and that they know are ethical. The final market segment of grocery shoppers tend to be attracted to quality, both in terms of the retail environment and the brands that they purchase. 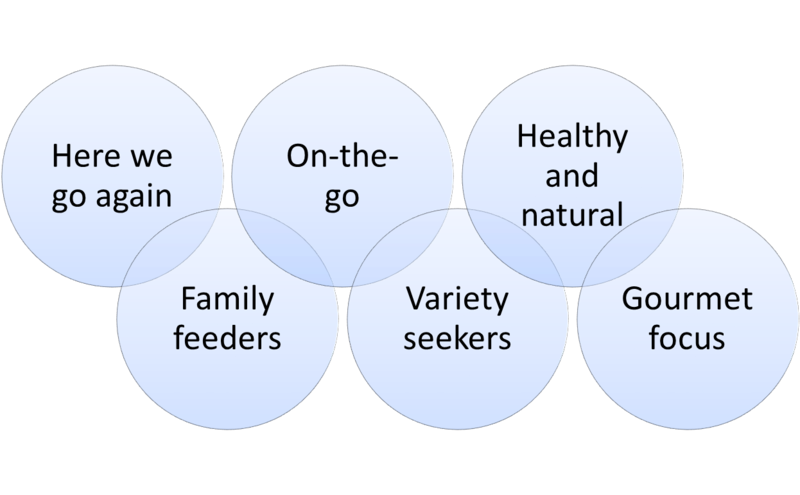 In terms of regular groceries these consumers seek out higher quality food solutions and are generally less price-sensitive. They are more willing to invest time in food preparation and have less need for snack options. These consumers would be most responsive to a brand that builds high-quality image, higher quality products, higher price products, but less responsive to sales promotions and discounts.